Image credit Amazon. I'll hopefully get my own images up soon for reviews. Image credit Amazon. I’ll hopefully get my own images up soon for reviews. 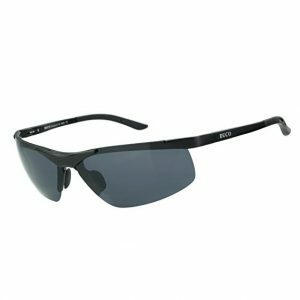 DUCO’s sports style sunglasses are, to put it plainly, absolutely fantastic, given their price – especially because they’re polarized. 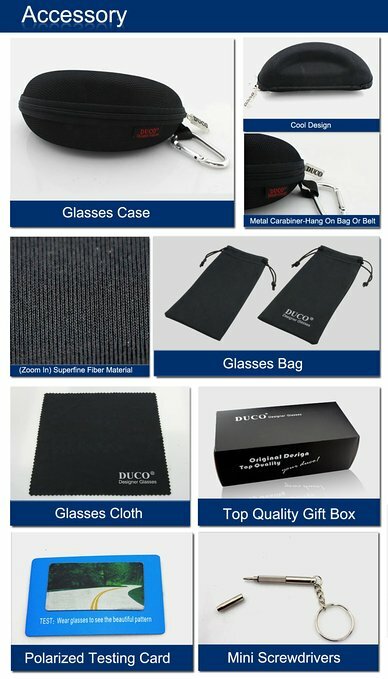 The glasses come with a hard case, a soft bag, a microfiber cloth, screwdrivers, and a gift box. It also comes with a little testing card for whatever reason. Designed in Italy, according to the label. I’ll guess they’re made in China – it’s not clear, though. Well, I don’t really need to tell you how to use them: you just put them on your face! I keep mine in my car, simply because that’s where I find the polarization helps the most. Since my Miata has a black plastic dashboard, it reflects a lot of polarized, bright white light; these just cut right through it. In my car, I stow them away in the glove box with the included case; this is also where I leave the glasses bag (I don’t use it, I just keep it in the case so I don’t lose it) and I keep the included microfiber cloth, to clean them when they get dirty. Need a good pair of sunglasses, but don’t want to spend an arm and a leg to get some – especially since you always stand the risk of losing them or breaking them? Get these DUCO ones instead! I’m very, very satisfied with mine – especially given how great of a price they are. Sure, the lenses are plastic, but I’m not sure you’d even notice after a while. I don’t. Want some? Use the link below – Amazon gives me a bit of a kickback when you do, which goes towards paying the bills for this site! PREVIOUS POST Previous post: I Broke The Website. Whoops.